Once upon a time a man flew by a helicopter over Georgia. He was looking down and in a mountain valley he saw a little town, built on the banks of the Kvirila river. He asked – “ჭიაა თუ რა? (Chiaa tu ra?)”. In Georgian that translates as “is that a worm or what?”. This is what the legend says, but the real history of the town starts in 1879, when the Georgian writer, poet, publicist and activist Akaki Tsereteli discovered high quality natural wealth in the town and began to export manganese. “There, where there is no road, no trace, a railway will be constructed and deserted Chiatura will be rebuilt” – Tsereteli promised. Long story short, Chiatura has been a major center of manganese production in the Caucasus since 1879. At the end of XIX century, after constructing a railroad, Georgian manganese was exported to world market. It was distinguished by its quality, even industrially developed countries like England, USA, Germany, France would trade for Georgian manganese. In its best days Chiatura was responsible for producing 60 per cent of the world’s manganese. Soviet authorities struggled for 50 years to find a transport system that would allow them to extract vast amounts of manganese. In an effort to conquer the town’s extreme geography, the first network of tramways in the Soviet Union was built in Chiatura in 1954. The productivity and output in the mines dramatically increased with the high-flying “metal coffins”, that are mysteriously still in service. Then the era of retrogress started – World war I?, civil war in Russia, newly discovered deposits of manganese in India, Brazil and South Africa had taken the world market and Chiatura’s luck ran out. Today, Chiatura is nothing but fortuneless, although a Hollywood-like sign – “Chiatura is my pride” welcomes visitors in the post-apocalyptic town. The city looks gloomy and dark, production of manganese blackened the whole town. Entering Chiatura, on one side you see the huge rocks, but on the other side you see the cemetery. Not a typical one, but a cemetery of trains, factories, mines, buildings etc. This cemetery, that is full of manganese hills, is the “entrance hall” of the town. “Manganese is called “black gold” and of course it accumulates a lot of money. But regular people get nothing from this money, our town has gained nothing out of it. This wealth must be visible in the town. Do you know how expensive the Manganese is? It is huge wealth, but you don’t feel it in Chiatura” – says Merab Kapanadze, a local in Chiatura. Rich poor Chiatura – this term is now inculcated upon Georgian media. „Today only foreign companies own Chiatura’s mines. As I now write its price is very high on the world market, but today a miners average salary is 600 GEL (approximately 250 USD). Every third man works the mines in Chiatura. We know that working here is not safe, but we are trying to survive, we have no alternatives” – says Ioseb Kapanadze, a mine worker in Chiatura. Miners working conditions are extreme. Security measures are not followed. Workers look at least 20 years older. They spend more than 45 hours under the ground every week, which is dangerous for their health. Even the water is polluted and locals get poisoned on a regular basis. People have raged over this situation many times, but the situation doesn’t change. As usual, companies raise workers salary by 10-15 USD and the protest actions calm down. 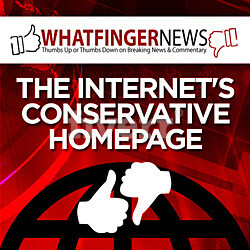 Because of no alternatives mine workers are forced to stay where they are. I have a personal affiliation towards Chiatura. My ancestors were born in the village close to Chiatura. I was 8 months old when my parents first brought me here. Since then I’ve been here every summer. My first impression about Chiatura was – “Wow, I would build the biggest entertainment park here and stop this people from digging ground” – It was my childish dream and my great plan for future. Today I think, that it’s a great place for shooting a post-apocalyptic movie – black river, abandoned factories, demolished populated buildings and rusty, jolty cable cars add to the excitement. Nowadays Chiatura is becoming more and more appealing to tourists. 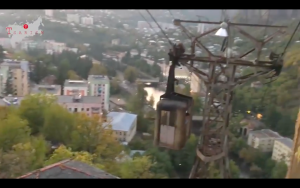 The main sightseeing of the town is the cable cars built in the 50’s during Soviet era. As mentioned above, the primary assignment of the cable cars was to carry workers to the mines above the town. But today there are many quarters built on the mountains, so locals use it as daily transport. It takes 20 minutes by bus to go up, while by cable car it takes only 5 minutes and it’s free. As the conductor Dali Tutberidze says, people come from everywhere to visit the cable cars and it’s safe to use, even though it was built 6 decades ago. Chiatura has more to offer, the Katskhi pillar is the second must-visit place. It is a natural limestone monolith located at the village Katskhi near Chiatura. On the 40 metres high pillar, there is a small church, built in 9th-10th century. It remained unclimbed until 1944. Nowadays, before you decide to climb it, know that only men are allowed to do that. If you already plan your visit in Chiatura, by no means miss the chance to visit small village called Mgvimevi, 3 km away from Chiatura. There is a convent located in the cave. I promise it will make a great impression. Thereby, as conductor Dali Tutberidze said, ordinary people are unable to understand this beauty. If you are not one of them, if you prefer Chernobyl over Paris, Bosch over Raphael, Wagner over Mozart, darkness over light – then Chiatura is the place you should visit right now. Autor: Qeti Ka. Qeti Ka is pseudonym of Ketevan Kapanadze. Qeti is from Tbilisi, Georgia. She graduated from Caucasus University, where she studied Journalism and Mass communications. 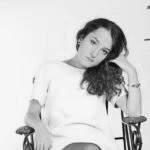 Today, she works in Georgian Public Broadcaster as a TV Show Producer. Before Qeti Ka worked as a journalist for several Georgian medias, including Radio and Web magazines. Now she is writing a book and soon is going to open her own bookstore. She speaks English, French and Russian and loves Flora and Fauna and everything related to literature.